1) Download instagram photos and videos. 2) Webkit based browser integrated. You can browse the instagram website, and add your favorite ID for downloading with 1-Click. 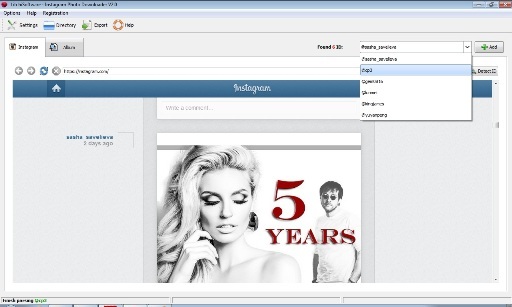 3) Software can detect instagram ID automatically when you are browsing instagram website. You can select a ID and add it to download list with 1-Click. 4) Albums are separated by month, you can select some of them or all of them to download. 5) Downloaded media is named with instagram post description. 6) When downloading is finished, the folder will popup, and you can view the downloaded photos and videos. 1) Download tumblr photos and videos. 2) Webkit based browser integrated. You can browse the tumblr website, and add your favorite ID for downloading with 1-Click. 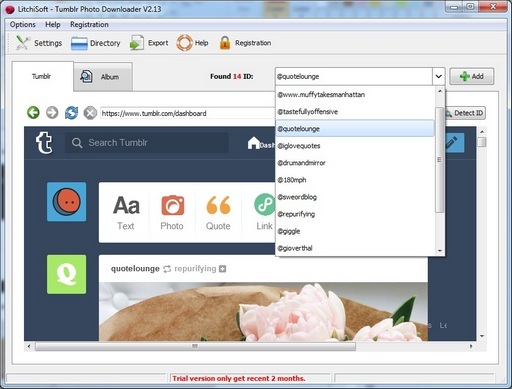 3) Software can detect tumblr ID automatically when you are browsing tumblr website. You can select a ID and add it to download list with 1-Click. 5) Downloaded media is named with tumblr post description. Windows IMAGE GRAB Image Grab is a very handy tool for downloading the images from a website, you can download images that are linked to from the site or download images that are shown on the website. It lists the images along with the size of them and you tick the ones you want to download. The website of the page to retrieve images from is shown as well. Please not these are free downloads but you still need to purchase the Regkey serial number key for unlocking your software,to finish the install process. All : Windows, including Windows 8, & 8.1 /7,ME,XP, VISTA,2000. Download Form Wizard Quickly create download forms on your website, where users can come along, enter there name and email address and have an email sent to them containing there download link – you also get an email with this persons email address. A fantastic tool for building up your mailing list! Please not these are free downloads but you still need to purchase the Regkey serial number key for unlocking your software,to finish the install process. All : Windows, including Windows 8, & 8.1 /7,ME,XP, VISTA,2000. Free Video Download & Converter is a desktop application that catches web links including videos from your clipboard or you enter and batch download them. 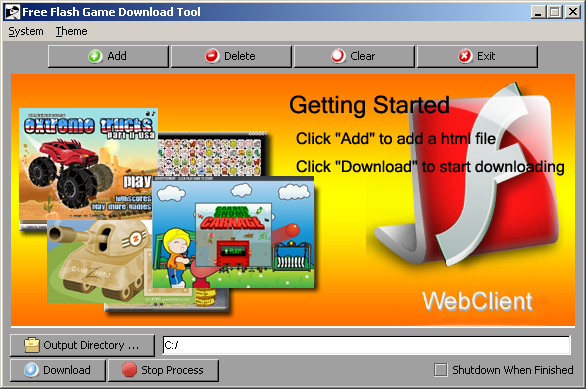 Start it up, copy the web URL and click download. It can automatically detects the video files. Key Features * Save videos in web page in a fast & convenient way. * Resume failed downloads. * Detect video files from an URL; * Search in local cache files; etc. * Powerful & convenient management of downloaded video files. * “Copy URL” function (hot key: Ctrl+C): can copy detected video item’s URL to clipboard. * Downloading in batches, download multiple files at one time. It allows you to load all video files you want to download, then click “Download” button to download them… * Easy to use – Just two clicks, everyone can become the master of Free Video Downloader & Converter. * High speed – 400% fast than normal download. Crawls, searches the internet for file types that you specify. Tell it what site or sites to start with and what type of files you are looking for and let it go. You can specify the number of files and depth that it will crawl. I have crawled over 178,000 pages in less then 1 hours in one search alone. Great for searching for pictures, movies, songs or anything else you can think of. Version 3.7 features: A lot of bug fixes; Faster search and better filters. Ultimate Maps Downloader can download satellite imagery, topographic and road maps from Google Maps, Yahoo Maps, Bing Maps (Microsoft Virtual Earth), OpenStreet Maps, ArcGIS, etc. All downloaded small tiles are saved on the disk and then combined in one big map image for offline use. You can save maps and tiles in several kinds of image formats such as bmp, jpg, png and gif. You can select multiple download servers and zoom levels at the same time. * Supported image formats are Jpeg, Png, Gif and Bmp. * Find locations by coordinates or name/address using geo-coding services. * Add markers to selected locations (with location information). * Calculate routes on your map. * Save map projects for future use. * Save map images as you see them on the screen. Become a registered user and we will make Ultimate Maps Downloader better for you. Bigasoft Video Downloader Pro helps to download and convert movies from all popular video sites like YouTube, Facebook, Google Videos, Metacafe, eHow, Vimeo, MTV, BBC, Dailymotion, and etc. The Video Downloader is a YouTube Audio Converter like YouTube to MP3 and a YouTube Video Converter like YouTube to WMV or MP4. It downloads and converts online videos for playback on computer or digital devices like iPad, iPhone and more. The professional online video converter enables to download a whole lot videos and playlists with high quality from YouTube, Facebook, Google Videos, Metacafe, eHow, Vimeo, MTV, BBC, Dailymotion, and etc. The powerful YouTube converter helps to convert YouTube videos to many popular video formats in real time after downloading high-quality YouTube videos by simply pasting URL(s). 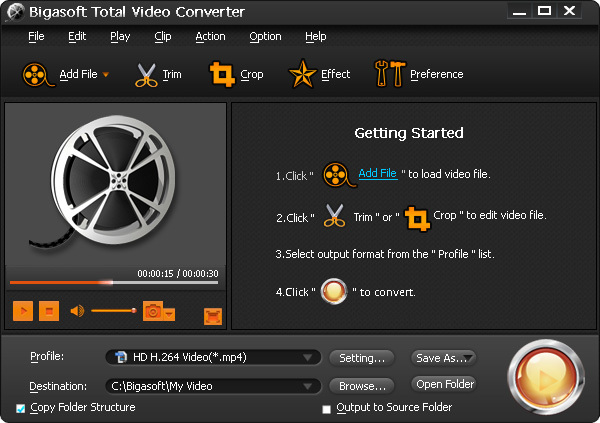 It can be used as a YouTube MP4 Converter, YouTube iPod Converter, and more. The smart YouTube audio converter is also a YouTube MP3 downloader which helps to convert YouTube to MP3 songs with high quality by extracting audio tracks to MP3. All YouTube music can be easily organized in music library with help of the YouTube music downloader. 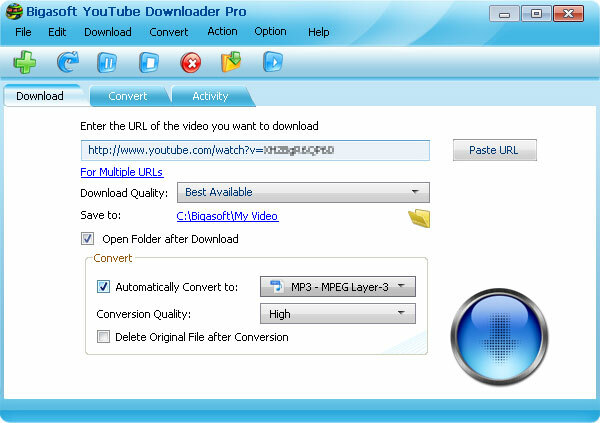 The favorite YouTube playlist downloader has the ability to download video playlist from YouTube and convert as opposed to just one video. It helps to convert YouTube music playlist to MP3 in background. Simply paste a URL from browser, select conversion profile and press “Download” button. It’s that simple. A huge number of converted YouTube movies are ready to play now. Bigasoft Video Downloader Pro is designed for an easy-to-use and one-step Video Downloader-converter. The Online Video Converter is fully compatible with 64bit/32bit Windows 8, 64bit/32bit Windows 7, Windows XP, Windows Vista, and Windows 2000.